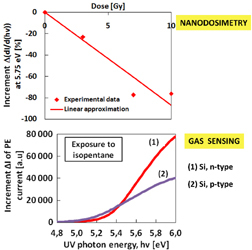 Photoelectron (PE) and thermostimulated exoelectron (TE) emission spectroscopies were explored for nanodosimetry of electron radiation and gas sensing. Lead sulphide (PbS) nanocrystals embedded in zirconia (ZrO2) thin-films were employed to absorb electron radiation and changes in PE properties of the films in dependence on absorbed dose were studied. Gases benzene and isopentane were adsorbed onto silicon substrates and changes in PE and TE emission properties of the substrates were explored. The research demonstrated that both PE and TE are promising approaches to use in sensing applications.